Picardy is a historical territory and a former administrative region of France. 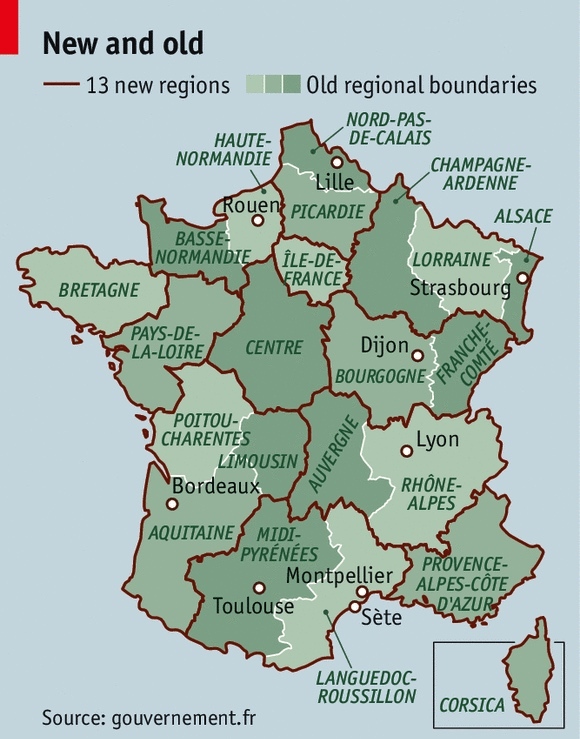 Since 1 January 2016, it has been part of the new region of Hauts-de-France. It is located in the northern part of France. … The historical province of Picardy stretched from north of Noyon to Calais, via the whole of the Somme department and the north of the Aisne department. The province of Artois (Arras area) separated Picardy from French Flanders. … One of the most significant historical events to occur in Picardy was the series of battles fought along the Somme during World War I. From September 1914 to August 1918, four major battles, including the Battle of the Somme, were fought by British, French, and German forces in the fields of Northern Picardy. … Picardy stretches from the long sand beaches of the Somme estuary in the west to the vast forests and pastures of the Thiérache in the east and down to the châteaux of Chantilly or Pierrefonds near the Paris Area and vineyards of the border with Champagne (Champagne picarde) to the south. … Historically, the region of Picardy has a strong and proud cultural identity. The Picard (local inhabitants and traditionally speakers of the Picard language) cultural heritage includes some of the most extraordinary Gothic churches (Amiens and Beauvais cathedrals or Saint-Quentin basilica), distinctive local cuisine (including ficelle picarde [a savory pancake stuffed with cheese, mushrooms, and ham], flamiche aux poireaux [a puff pastry tart made with leeks and cream], tarte au maroilles [a tart made with Maroilles cheese]), beer (including from Péronne’s de Clercq brewery) and traditional games and sports, such as the longue paume (ancestor of tennis), as well as danses picardes and its own bagpipes, called the pipasso. … Picardy is the birthplace of Gothic architecture, housing six of the world’s greatest examples of Gothic cathedrals, which envelop the history of Gothic architecture in its entirety. Amiens Cathedral, standing as the largest cathedral in Europe, which according to John Ruskin is the “Pantheon of Gothic architecture”, could house the Notre-Dame de Paris twice over. 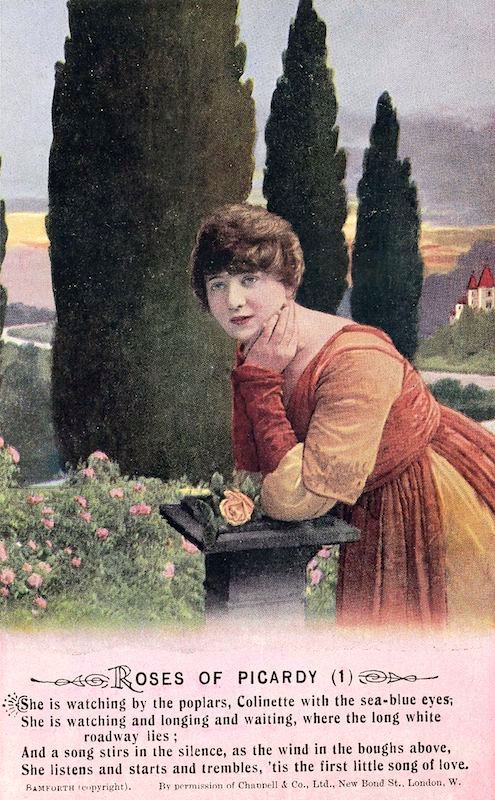 The lyricist Fred Weatherly had become impressed with beauty of the voice of the soprano Elsie Griffin, who later became a leading artiste with the D’Oyly Carte Opera Company. Her singing of his compositions resulted in his writing two of the most popular hits of the 20th-century “Danny Boy” (1910) and “Roses of Picardy”. 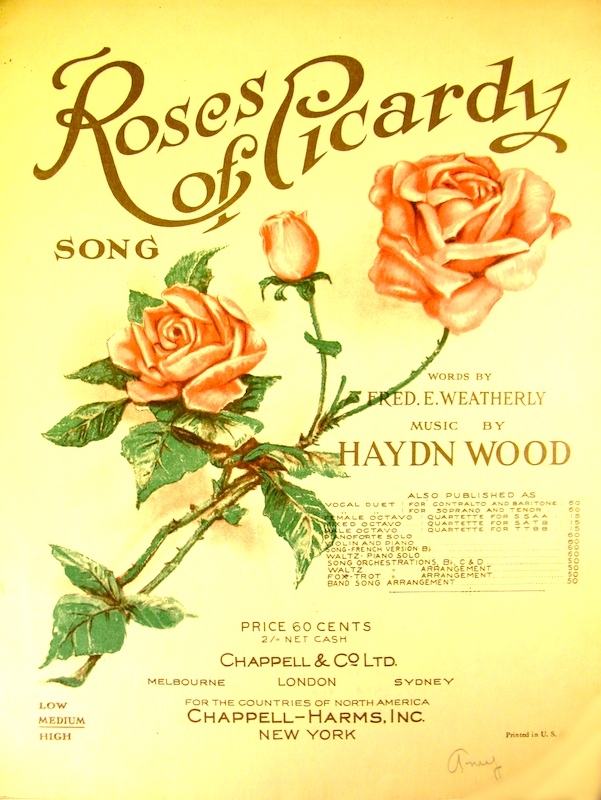 The composer Haydn Wood wrote the music for over 200 ballads, of which “Roses of Picardy” became his most popular. Wood related that, as he was going home one night on the top of a London bus, the melody came to him. He jumped off the bus and wrote down the refrain on an old envelope while standing under a street lamp. The exact story that lies behind the words of the song is unclear, but in his 1926 memoirs, Weatherly suggested that it concerned a love affair of one of his close friends. Weatherly travelled in France visiting the Rhone valley and Chamonix. Picardy was a historical province of France which stretched from north of Noyon to Calais via the whole of the Somme department and the north of the Aisne department. This area contained the Somme battlefields – the scene of some of the fiercest fighting during the First World War. The song quickly became popular throughout Britain, with British soldiers singing it when they enlisted for the Front in France and Flanders. Roses are flowering in Picardy, but there’s never a rose like you! But there’s one rose that dies not in Picardy! ’tis the rose that I keep in my heart! “Danny Boy” is a ballad [originally] set to an ancient Irish melody. English songwriter Frederic Weatherly wrote the lyrics, which are usually set to the Irish tune of the “Londonderry Air” [referring to the city of Londonderry in Northern Ireland, commonly referred to simply as Derry]. … Initially written to a tune other than “Londonderry Air”, English lawyer and lyricist Frederic Weatherly wrote the words to “Danny Boy” in Bath, Somerset in 1910. … [Two or three years later] Weatherly modified the lyrics of “Danny Boy” to fit the rhyme and meter of “Londonderry Air”. Weatherly gave the song to the vocalist Elsie Griffin, who made it one of the most popular songs in the new century. In 1915, Ernestine Schumann-Heink produced the first recording of “Danny Boy”. … The 1918 version of the sheet music included alternative lyrics (“Eily Dear”), with the instructions that “when sung by a man, the words in italic should be used; the song then becomes “Eily Dear”, so that “Danny Boy” is only to be sung by a lady”. In spite of this, it is unclear whether this was Weatherly’s intent. Indeed, the song has been covered by a diverse range of male singers, including Mario Lanza, Bing Crosby, Andy Williams, Johnny Cash, Sam Cooke, Elvis Presley, Shane MacGowan, Jackie Wilson, Daniel O’Donnell, Harry Belafonte, Tom Jones, John Gary, Jacob Collier, Harry Connick Jr, and comedian Peter Kay amongst many others. All used the original lyrics. … “Danny Boy” is considered to be an unofficial [Irish] signature song and anthem, particularly by Irish Americans and Irish Canadians. “Danny Boy” is [also] considered the anthem of Northern Ireland. Due to the complicated politics of Northern Ireland, an area [of] the United Kingdom on the island of Ireland (and populated by people of Irish and Scottish descent), anthems of both of those countries are used by their respective communities to indicate allegiance. For several sporting events where Northern Ireland competes individually, such as the Commonwealth Games, the local song “A Londonderry Air” is used as its anthem. This entry was posted on December 4, 2018 at 6:53 am and is filed under Language and food, Morning names, Music. You can follow any responses to this entry through the RSS 2.0 feed. You can leave a response, or trackback from your own site. There’s also the Picardy third (otherwise tierce picard or tierce de Picardie), a raised third creating a major triad in a cadence of a piece otherwise in minor, frequent in Renaissance and Baroque music. The Wikipedia article says that the origin of the name is obscure, and might have nothing to do with the province of Picardy at all. The hymn tune PICARDY, originally a perhaps 17th century French carol, is sung with the words “Let all mortal flesh keep silence”, a translation by 19th century Anglican hymnographer Gerald Moultrie, of a text from the Liturgy of St. James, perhaps as early as 275 CE, and still sung in full in some Orthodox traditions. The hymn is in use by Episcopalians (EH 324), Lutherans, and Roman Catholics, and is frequently sung in my Episcopal congregation and in several others I’ve belonged to. My antique (1958) Lutheran hymnal has it twice (281 and 343) in two different harmonizations, both in D minor. And there it is in my much less antique (1982) Episcopal hymnal, as 324 (also in D minor).